This is a cool recipe. The pancakes taste fresh and fruity and the nuts give just the slightest crunch. If you turn a pancake over you'll see the pecans and pieces of peaches. 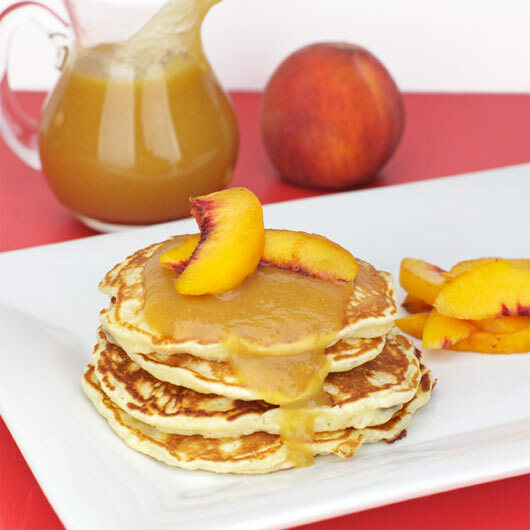 I topped mine with homemade peach pancake syrup and more fresh peaches. It was a peach explosion and I loved it! In a separate bowl, cream the butter with the sugar using an electric beater. Add the eggs, milk, vanilla and mashed banana and mix until well combined. Add the wet ingredients to the dry ingredients and mix with a spatula until just combined and moistened. Fold in the peach pieces. Place a frying pan over medium heat and gently spray with cooking spray. When hot, dollop batter in 1/4 cup amounts per pancakes. Immediately sprinkle about a Tablespoon of chopped pecans on the top side of the pancake. When the edges look dry and bubble start forming over the top, flip pancake and cook other side to golden brown. Repeat with remaining batter. Keep finished pancakes warm on a cookie sheet in the oven set to 225 degrees until ready to serve all. Depending on the size of your peach and banana, you may need to adjust the milk or flour to make the batter workable. If the batter doesn't spread out to form a decently thin pancake, add milk a Tablespoon at a time until it does. If it flows to much in the pan, add a Tablespoon of flour a Tablespoon at a time to thicken it up. Expect the shape of the pancakes to be a bit on the rustic side. You'll get near circles, but the the peaches keep the batter from forming perfect disks. Three great tastes that taste great together: peaches, banana and pecans. Top with butter and maple syrup or try additional fresh peaches and whipping cream. Recipe number 3199. Submitted 8/16/2013.